Rebuild Foundation. Image by Justin Goh. The question of why an artist lives in a particular city is often as intricate as the metropolis’s scattered map. Cultural infrastructure, support networks, collectors, commercial galleries, teaching opportunities, like-minded dialogue, affordable studios, proximity to Artforum’s offices, money, family, MFA programs, city parks, simple math. In many places across the nation, art is being made. In a smaller number, great art is being made. Not because of the city, but because greatness is rare. And yet, a question that must arise, seemingly, in every city that is neither New York nor LA, is whether it is possible to pursue a career in the arts there. Even if it is possible, is it advisable? I have observed enough discussions in communities as diverse as Chicago, St. Louis and San Francisco circling the same set of questions to understand that the question is a near-universal one riddled with anxiety, insecurity and a bit of desperation. After all, what if you are wrong? The thing about the question, though, is that it can never be answered. There is an ease to prerecorded history. Attend these schools, live in these cities, flatter these galleries and you’ll end your twenties in a Whitney Biennial, surrounded by all of your friends. If the art world is primarily about connections, then proximity to the highest concentration of influential individuals has a kind of logic. If, however, it is about creating meaning, then that same path is perhaps toxic. Meaning arrives in disjointed leaps. It is incremental, exchange-based, one person or idea to another. It expands along unpredictable paths, often not leading anywhere near a biennial. And yet, something in the world has ruptured. One can live creating connections with all the right people or working to create meaning that will always make its own connections. If a new (art) world forms, my guess is that it won’t happen in New York, or Los Angeles for that matter. Maybe it is already nascent in St. Louis, maybe Albuquerque, maybe Kansas City, maybe Minneapolis. Or perhaps it is simply in the unpredictable connections between these places. One perspective states that working away from the coasts creates a relative isolation that forces great artists to be greater. Artists are more likely to follow a personal vision, assuming they have one. Those who take the space and time allowed and, with sheer force, bring something into being, bear more weight than the coasts, but too often gravity without that force leads many to settle in the center. An artist wants to live in an unformed world. Anyone whose vocation is to make something needs a place without everything. 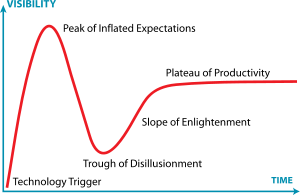 There is a lure to proximity, to the sugar rush of an art center, which more often than not crushes the new idea like a cultural model of Gartner’s Innovation Hype Cycle. The Peak of Inflated Expectations leads so quickly to Disillusionment. Visibility and Time, cramped in a small space waiting for a trigger. In the absence of hype, ideas gather. Many dissipate, some deepen, a few finally build into something bigger. If art centers are constantly being revised and rewritten, off-center cities like St. Louis are always in the process of being articulated. The representative St. Louis artist, in this view, would be Martin Brief, whose recent exhibition at Isolation Room was comprised of a single piece, entitled Success, that made a quiet spectacle of the question by copying the word ‘success’ and its etymological outcroppings by hand on a single sheet of vellum. The process reportedly took the artist 400 hours in the studio and a full year to complete as the follow-up to his brilliant 2010 Great Rivers Biennial exhibition at the Contemporary Art Museum in St. Louis. Martin Brief. Amazon God installation view. St. Louis is not New York, nor is it Detroit. The grand summing-up statements are more difficult. There is no easy cliché, only a few observable realities: for a city its size, the number of thriving visual art institutions is astounding; houses, studios, and galleries are almost impossibly attainable; and, finally, no one knows whether it is possible for one to pursue a career here. Of course. One can view an empty house as a blight or a gallery and we have many empty houses. In recent years, many have begun to fill after a long time dormant. Houses like the one Cosign Projects wrapped in spandex. Los Caminos‘s apartment above a barber shop; the Rebuild Foundation‘s span of shotgun houses; Good Citizen‘s mixed-use storefront and billboard. This city was a center once (so I hear), but I prefer this one. In the absence of hype, ideas gather, connections build, jagged at first, inarticulate. Then, all of a sudden, worlds emerge. Cities often have latin mottoes. Detroit’s is famed: Speramus Meliora and Resurget Cineribus (we hope for better things, we will rise from the ashes). For the last couple of years, I’ve claimed one for St. Louis: A posse ad esse. From possible to real. This is for the city I think we can build because it is built, unbuilt, and rebuilt in every moment. The bakers, builders, brick rustlers, scrappers, painters, artists, musicians, freaks, moms, dads, brothers, sisters, preservationists, developers, politicians, fighters, losers, writers and winners – all knotted together like a bundle of outmoded Christmas lights. Some burn brightly, some stay dark and others only flicker, but next time it will be a little different – a new experience, different incandescence. Made and remade. Let’s see the city for what it is: contested always. We can build a deep democracy in St. Louis because the constitutive pieces are already present – we just need to start recognizing these elements, these multiplicities of forms and styles and ideas. A politics of bricks, a thoughtful civil society making claims to its city. Horizontal and freed from all the burdensome convention of business, government, planning and growth. We don’t need a recapitulation of the old ways – those ways plant the seeds of disrespect and negligence, of a crude pragmatism. We can be a city not in pursuit of an ideal type, but as a place of constant becoming. I may live in Portland (temporarily), but the pulse and brio of St. Louis dwarfs this city. In the “Lion of the Valley,” citizenship is growing under the skin of the city. Let’s begin to see it. In the end, nothing is certain and there are no dualisms. We are never going in one direction of development, but, in the shocks, spirals and scribbles, at least we are going together. Too much amnesia threatens to thwart the inimitable substance of St. Louis. Resist this forgetting. Why is St. Louis different? With the right sensitivities we can recognize the lived urbanisms and the deep democracy. A city doesn’t need to be coherent or orderly. The “disorder” isn’t a crisis – it’s wrapped up in the life of the place. By looking closer, engaging the street and stepping away from the slogans of growth and development, we can see the possible always becoming real. Great thoughts, RJ. St. Louis feels very contested right now in very healthy ways. It is such a complex city, but the number of people actively grappling with its legacy and what it means for the future of the region is an incredible sign of progress. A posse ad esse indeed. Thank you for giving words to this phenomenon that I’ve know but could never express. You know a bit of my strivings to practice and engage with art here in St. Louis since moving from California. When I moved, I quietly mourned the idea of ever being a part of a great art scene simply due to my new geography. When I first arrived here five years ago, I checked out every arts hub I could and it confirmed my suspicion. Now five years later, I willingly talk up the region’s art cred to my California tribe for all the reasons you mentioned. After I moved here, I took a deep sigh, said this place will never be cool and will never be NY or LA, and quietly put away important art-world aspirations. Then, I still made work ’cause I wanted to. I saw other people making work that was authentic and rivaled work I could see on the coasts. I have seen St. Louisans stare at what’s missing from their city and go create it. As you put it, there is meaning in much of what’s happening, which is experientially more nourishing than all the conjured sublimity of going to the MOMA. There is an inward emptiness left by going and seeing work that is *supposed to be* important like what I find in most institutionalized art meccas compared to seeing work that *is* important like I’ve been privileged to experienced here. Thank you for this reassurance. I live west of the city and I am very new to the StL art scene, (I have my very first solo show at the St. Louis Artists Guild on the 30th of this month!) I have tried to look at my residential location as a positive thing, 45 minutes from downtown St. Louis. I absolutely lack influence from a saturated art scene! I often questioned if I am waisting my time out here and this article (and related comments), both reassure and inspire me to continue believing in our city’s art community.